"Kidnapped & Catriona: The Adventures of David Balfour (Illustrated)" is a historical fiction adventure novel by Scottish author Robert Louis Stevenson, written as a "boys' novel" and first published in the magazine Young Folks from May to July 1886. The novel is set around 18th-century Scottish events, notably the "Appin Murder", which occurred near Ballachulish in 1752 in the aftermath of the Jacobite rising of 1745. Many of the characters were real people, including one of the principals, Alan Breck Stewart. The central character and narrator is a young man named David Balfour. Balfour is young and naive but resourceful; his parents have recently died, and he is out to make his way in the world. One day, David founds himself bound hand and foot, in the hold of the ship. 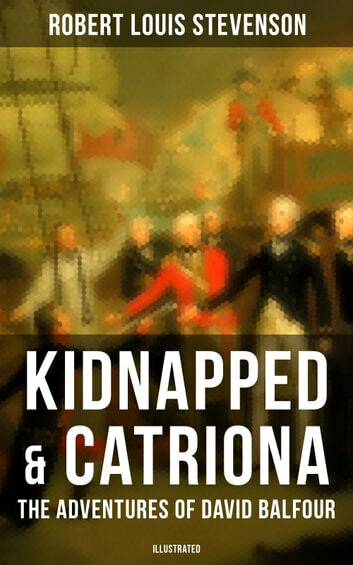 He was kidnapped and cast away… Catriona (also known as David Balfour) is a novel written in 1893 as a sequel to Kidnapped. It tells the further story of the central character David Balfour. 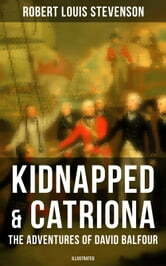 The book begins precisely where Kidnapped ends, at 2 PM on 25 August 1751 outside the British Linen Company in Edinburgh, Scotland. Robert Louis Stevenson (1850 - 1894) was a Scottish novelist, poet, essayist, and travel writer. His most famous works are Treasure Island, Kidnapped, and Strange Case of Dr Jekyll and Mr Hyde. A literary celebrity during his lifetime, Stevenson now ranks among the 26 most translated authors in the world.